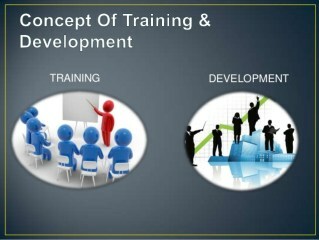 In this article we will study the Concept of Training and Development. we will discuss about training as well as development of employees in an organisation and also discuss why training is important for company employees and how it helps in development process. “Training means equipping the employees with the required skills to perform the job. Organisation sent employees for training because that they perform job in expected manner and it concern with teaching technical skills only”. “Development is the process for the overall growth of the employees for future management tasks of increasing difficulty and scope and it is concern with the teaching technical, human and concept skills”. * Helps in problem solving. * Helps to adapt change. * Better career option. * Boost up the morale. * Less chances of accidents. Reduce learning time – A trained employees takes less time for learning job as compare to untrained person and it creates higher productivity in the organisation. Better performance – The trained person performance is always better than the untrained person and it helps organisation to better perform. Attitude formation – Training and Development helps employees to develop positive attitude towards organisation. Better career option – After attending training employees brings developed skills and knowledge which helps them for better career option. Earning more – Improvement in efficient performance of employees helps the employees to earn more. Boost up the morale – Training increases the satisfaction and employees morale. 1). On-the-job training – When the employees are trained while they are performing the job then it is known as on the job training. On-the job method is suitable for technical jobs and advantage of this method is learning the practical problems while working on the job. (a). Apprenticeship programme / Training. 2). Off-the-job Training – It means training the employees when they are away from their working position, means when employees get break from training and sent for training. This method is more suitable for managerial job position as conferences, seminars, etc.